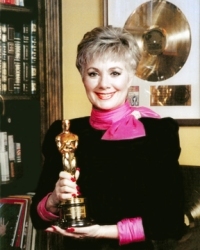 Shirley Jones, who starred in Hollywood musicals has been honored by the Pittsburgh Civic Light Opera for her lifetime contribution to musical theater. Jones, who was born in nearby Charleroi, Pennsylvania, was presented the Richard Rodgers Award for Excellence in Musical Theater on Saturday. Previous recipients include Mary Martin, Julie Andrews, Bernadette Peters and Gwen Verdon; composers Stephen Sondheim and Andrew Lloyd Webber; and theatrical producers Cameron Mackintosh and Harold Prince. Jones, 73, will appear as Aunt Eller in the Pittsburgh Civic Light Opera production of "Oklahoma!" this month. She played Laurey Williams in the 1955 movie based on the Rodgers and Hammerstein stage musical. "To be able to return to the stage anywhere 52 years later and do anything would be an accomplishment, I suppose," Jones said in a statement. Jones won an Oscar for her role in 1960's "Elmer Gantry." Her screen credits also include "Carousel," "The Music Man," "The Courtship of Eddie's Father" and "The Cheyenne Social Club."